It doesn’t seem like two minutes since Town dramatically secured another season in the top flight with that point at Stamford Bridge, but tonight (Tue 10/7) marks our first pre-season game. Although not as many new faces have arrived as is usual under David Wagner, Town have had yet another busy summer period, as we build up to a mouthwatering opening encounter with Chelsea in just over a months time. Back in May, Town announced that Olaf Rebbe would be joining the club as Sporting Director. He will assist Wagner with recruitment, and oversee all football operations, a role similar to the one that Stuart Webber and David Moss had previously held. The German has previously held the role at Wolfsburg. Dean Whitehead is definitely not a new face to Town, as a fans favourite and a big part of our recent successes, but he hung his boots up at the end of last season. He will switch roles and take up a position as under-19’s coach when he completes a period of working with David Wagner and the first team. He follows ex-skipper Mark Hudson, who now leads the Under-23’s. As seems normal now, Town had some of their transfer business done before the season had finished, with Jonas Lössl and Florent Hadergjonaj agreeing permanent deals following their successful loan spells. The latter won Town’s Young Player of the Year award, whilst Lossl contributed massively to safety with some hugely important saves throughout the campaign. After the season’s conclusion, Town secured one of their biggest transfers of the David Wagner era, by securing the permanent services of last year’s loan star Terence Kongolo for a club record fee. Kongolo transformed Town’s backline with outstanding performance after outstanding performance, and his quality and presence will be a major boost heading into the difficult second top-flight season. Wagner has also added another goalkeeping option, with Ben Hamer joining from Leicester City. Hamer arrives following the departure of Rob Green, and will provide far better competition to the brilliant Jonas Lössl. Although Hamer has been number two at Leicester, his addition will strengthen Town’s depth in the goalkeeping department, alongside Coleman and Schofield. A further two additions have been made, with the arrival of Egyptian international winger Ramadan Sobhi from relegated Stoke, as Town look to add real quality from the wide positions – an area that was a weakness last term. Furthermore, bright Dutch youth international Juninho Bacuna has joined from FC Groningen. He is a central midfielder and despite being just 20, he has almost 100 Eredivisie appearances. As is becoming the norm every summer, the talk is about David Wagner, and which clubs are interested in his services. But yet again, he has shown his loyalty and love for Huddersfield Town, by penning another new deal. Him, Christoph Buhler and Andy Hughes have all signed contracts until the summer of 2021, as the wonderful story is set to enter a new chapter. 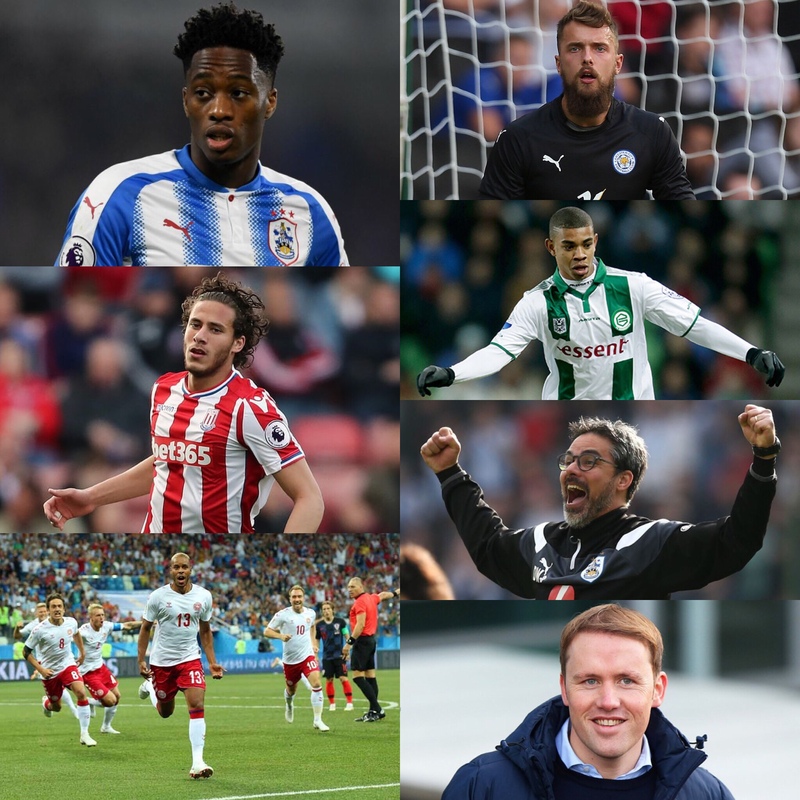 On the contract front, stars Laurent Depoitre and Danny Williams only have one year left on their current deals, alongside Scannell, Hefele, Hiwula, Holmes-Dennis, Payne and Coleman. Town have released two of their three shirts for next season, and they’re the nicest for a long time. The club have reverted back to supplier Umbro, and have gone relatively ‘traditional Hudderfield Town’ in their styles, with the blue and white home shirt, and the red and black away strip. Sales records have already been broken, with the club far more geared up for Premier League life this time around. It hasn’t been a summer away from all football, as we’ve been treated to the World Cup. The greatest tournament hasn’t failed to deliver, especially given England’s successes and achievements. Although no Town players have featured for the three lions, four of Town’s squad were involved at the tournament. Aaron Mooy was the star of the show for Australia, as they narrowly missed out on progressing further than the group stage, whilst new-boy Ramadan Sobhi featured in all three of Egypt’s group games. Jonas Lössl and Zanka were both named in the Denmark squad, and although Lössl was only number two, Zanka played a huge role, becoming Town’s first ever World Cup goalscorer. He netted in the last-16, only for the Danes to agonisingly lose on penalties to Croatia. Town’s World Cup players are currently taking a break before joining the pre-season squad. The current squad take on Bury and Accrington before heading to Germany to face Dynamo Dresden. Whilst in Germany, the squad will also take part in the Interwetten Cup in Essen, which involves Rot-Weiss Essen, Real Betis and Werder Bremen. They will also face SV Darmstadt 98 before their return to the John Smith’s Stadium for their annual home pre-season encounter, hosting Olympique Lyon. Two final pre-season games will see the team return to the pre-season spot of recent years, Austria, where we will play games against FC Bologna and RB Leipzig.